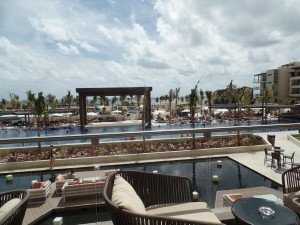 Home » Blog2 » Trip Reviews » Resorts » Royalton Riviera Cancun Resort and Spa: Should you Go? 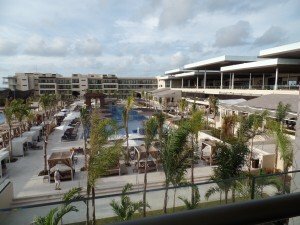 This post reviews what it’s like to experience the Royalton Riviera Cancun Resort and Spa. NOTE: This is a long post broken up with sub-headers, feel free to scroll around to explore what most interests you. During this trip, I also did a site inspection of the giant Iberostar Paraiso complex. I spent 6 days at this incredible resort in April, 2015. This newly built resort is a quick drive from the airport and dazzled me in many ways. The Royalton Riviera Cancun (Royalton) is a very modern and sleek design. Want a traditional Mayan style resort? 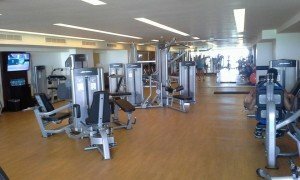 Check out my Iberostar Paraiso Report. This resort is accessed via Highway 307. Most Riviera Maya resorts are East of Highway 307 via an access road. The Royalton is just South of Cancun airport (CUN). The access road has some twists and turns as you approach (with numerous speed bumps). As you see the West side of the resort in the distance, the first thing you’ll notice is that the Royalton is a very large structure parallel to the beach; the wonderful advantage of this design is that most everywhere has a view of the Caribbean Sea and most bars, restaurants, and facilities are close to most of the rooms. The resort is designed with multiple U’s facing the sea. Plan your Royalton Resort Trip TODAY and receive a $75 gift card! Get your gift card prior to your trip. The main building holds the main check-in concierge office, the spa, Diamond Club Lounge, Diamond Club check-in, coffee/ice cream shop, tours, and other shops on the main floor. The main floor is completely open to the East allowing the delightful Caribbean breezes into the main seating area. The downstairs of the main building holds the buffet, Grand Marche (display kitchen as staff calls it), and other restaurants. From the main center building, the resort spreads out in either direction to the guest rooms. The main building also branches off into the main “U.” The Diamond Club and Hideaway are to the South while the main and family sections are to the North. In total, there are 4 “U’s”: Main resort, family section of Royalton, Diamond,and Hideaway. This is the “main’ resort for all ages. In addition to what you’d expect at an All-Inclusive, there is complimentary WiFi throughout the resort, and reservation-less dining at all of the a la carte restaurants. While reservations are taken, you do have the right to show up at any open restaurant for dinner as you wish; this is a MAJOR advantage over many All-Inclusives. While there may be a line, at least you can go where you want if you’re willing to wait. We never had a long wait for dinner seating while we were there. Note: Some restaurants are only for Diamond and Hideaway guests. sections for breakfast, lunch and dinner with quality food. The only downside was extremely dry rolls. The offered display cooking for Mexican specialties, meats, seafood, and numerous other items. 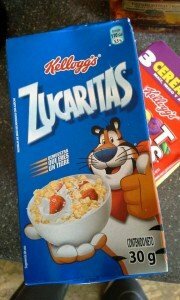 They also had Mexican versions of cereals (shown in the adjacent picture). I’ll admit to having cauliflower or broccoli for breakfast since it was there and I wanted to maintain my vegetable intake. 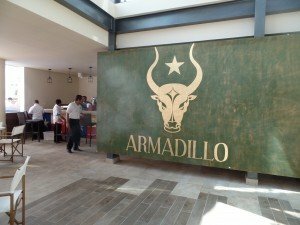 We had lunch twice at Armadillo’s | Tex-Mex Cuisine. Armadillo had a fun menu and a nice ambiance. I’d have to say that we really didn’t care for OPA! Mediterranean Cuisine; not bad – just was not into it. Grazie Italian Trattoria was located literally inside the family pool (nestled in between buildings 7/8/9). The food here was good. Nibbles is the snack bar located at the edge of the family section right across from the beach; Nibbles offer fries, burgers, nachos, etc.. We also had lunch and dinner at The Beach Club Grill; this was a casual Caribbean style place located right across from the family beach area. We had dinner on our last night at the resort at Agave Mexican Cuisine; this place was real authentic Mexican cuisine in an elegant ambiance. We never made it to Zen Japanese Cuisine; this place was the hardest to get into especially since it featured Hibachi tables; there was a line in the morning at the concierge office to make reservations. We didn’t desire getting into Hunter Steak House | Steak House. so, I cannot make any first hand comment on these two places. also in a separate section and have pools for exclusively Diamond Club members. 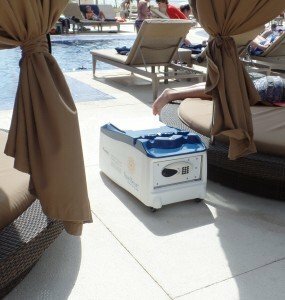 Notice this blue and white cooler safe. This is a unique feature of the Royalton Diamond Club. You can have your butler fill the cooler with beverages of your choice and then lock up your keys and smart phone inside while the cooler stays at your butler-reserved seating area. The Hideaway is the adults only “resort within a resort.” Hideaway guests can use all of the facilities of the main Royalton resort. The rooms in this section do have upgraded amenities including a custom beach bag and an upgraded room-service menu. The vibe or “happening” (as my excellent guide/sales executive Mr. Angel Velasquez put it) in this section is more subdued than the main Royalton. The Hideaway Diamond is the ultimate experience for adults at the Royalton. The Hideaway Diamond has the service of the main Diamond club and more in its own lounge. The drinks were great. The bartenders were generally friendly and quick. We really enjoyed Dips Swim-up Bar at the main pool. The Encore Swim-Bar at the family pool next to Grazie was incredibly crowded when we were there. The service was so slow that we left. The main Royalton beach bar is on an elevated deck with open air seating. The in-room mini bar is stocked with Corona Light and Modelo; not award wining beers but they are fine. And there are no “mini” airplane-sized liquor bottles here – our room was stocked with five 750ml bottles of premium liquor, including Absolut and Johnny Walker Red Label. I tried to enter SCORE Sports Bar and Lounge for the final game of the NCAA Men’s basketball championship to cheer on Duke (being an ACC alumnus). Couldn’t even get in the door it was so crowded with red-shirted Wisconsin fans. This is a nice sports bar and open until 6 am for both drinks and snacks. The rooms are some of the most luxurious I’ve ever inspected or stayed in, and I’ve been in a lot of rooms! We were assigned room 7310. this room is an ocean view junior suite which faces the main pool with a great view of the Caribbean Sea. The room has a separate jacuzzi tub, two-basin vanity and a dual head rain shower which is as fabulous as it sounds. The toilet is off in its own little room. The TV is all IP-based which means it is very cool after you get it to work. We also had an ample-sized balcony with a partially-obstructed view of the main stage for the nightly shows. 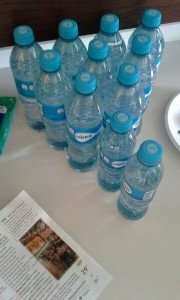 Royalton Riviera Cancun – mucho agua! We experienced great service throughout our stay. Since we were concerned about drinking the water out of the faucet in the room, using it for tooth-brushing, etc., we asked for extra bottled water by leaving a note in my best Spanish, ” Mucho agua, por favor” with a $5 tip. This resulted in the photo the left. The room was made up nicely each day. As we were out of the room for hours at a time some days, I cannot tell you what times the room was made up. 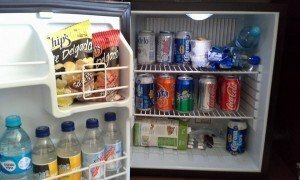 I spoke with the man who stocks the mini bar and he was happy to provide as much beer as I could request. He also told me how much he makes in one day at the resort – not much at all! Please TIP the staff well as they make very little money. The kids club is a beautiful two-level facility with a separate check-in/show-drop section outside of the club. Children are signed in and enter through one door. As of my April visit, I must report a BIG issue. The first time we dropped the kids off, we merely signed them in and left. It was just too easy for a first time check in. The second time we went to check them in, the person at the sign in desk asked what kind of ribbon the kids had tied to their bracelet? Ribbon? What ribbon? Apparently they assign a certain color ribbon to identify whether the children are authorized to sign out on their own. We were also asked to fill out a registration form which you’d normally get on the first time you signed the kids in to the club. On one occasion, I went to pick up the kids and was asked, “are they your children?” I was not asked to present my password…not good. These are significant security lapses; I cannot recommended the club for younger children until they have standardized security policies that are consistently enforced. The teen club is come and go at your own convenience – a totally different story here. 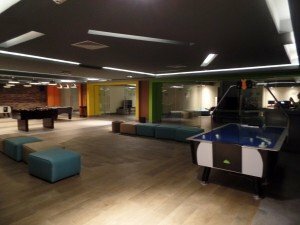 This is a large facility with a dance floor, video games and other fun stuff. The beach itself was just perfect with lots of beach loungers and hammocks. The WATER was the subject of a lot of controversy during the Winter/Spring season of 2015 as there was a huge influx of seaweed from the Sargasso Sea that accumulated on beaches all over the Rivera Maya region. As of early April, it was dense and it made the water murky Hopefully, it is better now but this is nature and there is nothing the resort can do about this seaweed. As much as they tried to clean it up, it was impossible to keep up. For crystal clear Caribbean water, please read my review of Xcaret Nature Park. I did not even attempt to count the number of pools, which goes into the low double digits. The pools are also heated which kept them at a delightful temperature. The pools are truly spectacular and you can find a pool for every level of quiet or music and activity you desire. The staff is starting to reinforce the whole “towel-on-the chair” bit as people will get up very early in the morning and drop a towel across loungers, day beds, etc., and thinking they own the spot for the entire day. The Diamond and Hideaway sections have butlers to help you secure chairs/loungers/beds at the pools and beaches located for their guests. We did have a problem with towels on one afternoon and could not find any towels at all but did see the dirty towels piling up. Other than that, no issues with towels. NOTE: there are no towel cards; you just go and take towels as needed. The beach seating was less crowded in the afternoon. 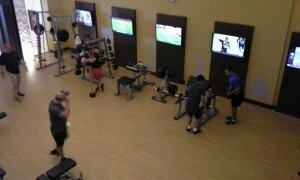 has free weights and squat racks downstairs and cardio equipment and selectorized weight machines upstairs. There is access to the rooftop tennis courts from the upper floor of the gym. The second floor also has nice views of the West side of the Royalton. If you exercise very late, then you’ll get to witness the sunset. Let’s get started today on your Trip to the Royalton! Get a $75 Gift Card with your Riviera Maya Trip.